Pops says we finally made it to DVD! And Pops is right! Whether you're a fan of old school comedy or of really old school comedy you got a DVD treat during the month of February. This month's installment of Missing No More turns up two more past Horn Section reviews that just made it to DVD. These new releases date back to our blog's earliest days; in fact, both were among the first ten films reviewed here back in 2006.
WHO'S MINDING THE MINT? (1967) was finally rescued from DVD unavailability by our friends at the Warner Archive on February 7th. If you were a little disappointed by TOWER HEIST (who wasn't?) and would like to see how a caper comedy is supposed to be done, by all means check out this oldie-but-goodie. Danny Peary accurately said it is "from the IT'S A MAD, MAD, MAD, MAD WORLD school, but on a smaller scale". Indeed it is, and that's not only what sets it apart from the better known WORLD, but makes it even funnier. Yep, you heard me right. Hell, I said so in my original review. MINT checks in at a lean, clean 97 minutes (barely half of WORLD's length) and with all due respect to Stanley Kramer (JUDGEMENT AT NUREMBERG, INHERIT THE WIND), he wasn't exactly a comedy specialist. Howard Morris (YOUR SHOW OF SHOWS) was, and he pulls out all the stops without telegraphing it as much or allowing intrusive mugging. It's an impressive directorial debut for Morris, who actually beat his YOUR SHOW OF SHOWS colleague Mel Brooks "to the chair"--Brooks' legendary first film, THE PRODUCERS, arrived in 1968. It's not easy being green! Compared to IT'S A MAD, MAD, MAD, MAD WORLD's all star cast, MINT is loaded with second bananas, but it's still an impressive bunch. (Ha! "Bunch"! Get it?) 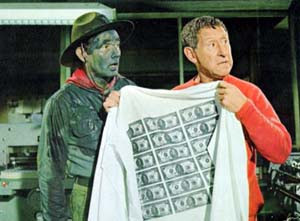 Jack Gilford, Walter Brennan, Bob Denver, Victor Buono, Joey Bishop, Jamie Farr and Jackie Joseph are among the TV stars getting some big-screen love. Morris cast two actors from WORLD: Lou Costello's 30 FOOT BRIDE herself, Dorothy Provine (also in Blake Edwards' WORLD-styled THE GREAT RACE) and Uncle Miltie Berle, whose lodge costume is put to inspired use by Morris. Here is my original review, from way back in May 2006. WHO'S MINDING THE MINT? was out of print on VHS even then, and has been really hard to see for a long time. The film deserves a hearty welcome back to circulation. It is also available for viewing at Amazon. 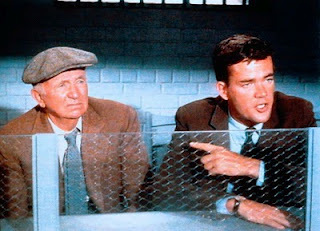 A bit of trivia: the producer was Norman Maurer, Moe Howard's son-in-law. 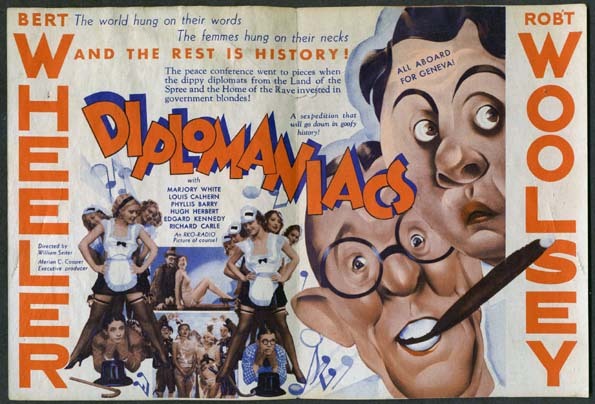 DIPLOMANIACS (1933), another long awaited title, was rather quietly released on Valentine's Day by the Warner Archive. In my original review I bemoaned the lack of DVD love given to Wheeler and Woolsey, perhaps the most unsung of the classic cinema comedy teams. Happily, Warner Archive has been rectifying that situation over the last year. In 2011 PEACH O'RENO (1931) and GIRL CRAZY (1932) got the "two-fer" treatment at the Archive, and DIPLOMANIACS was one of four Bert and Bob vehicles to get a Valentine from WA this year with KENTUCKY KERNELS (1934), THE RAINMAKERS (1935) and ON AGAIN OFF AGAIN (1937) also being released on DVD for the first time February 14th. Unfortunately the latter three are all post Production Code, and therefore the team's finest film, COCKEYED CAVALIERS (1934) is still missing from DVD. Quibbles with the film selection notwithstanding, we now have fully one-third of the 21 Wheeler and Woolsey films on DVD through Warner Archive (1929's RIO RITA rounds out the list). It's atypical "Bert and Bob" as usual leading lady Dorothy Lee is nowhere to be found, but the Pre-Code DIPLOMANIACS is still the best of the new arrivals. DIPLOMANIACS might well be the best anti-war comedy that predates DR. STRANGELOVE. Does any of the following sound real-world familiar (even today)? 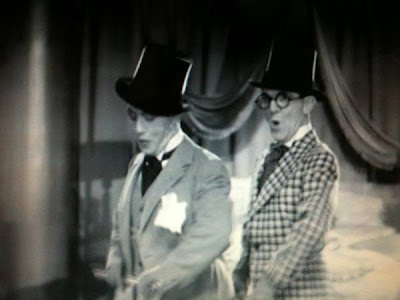 Bert and Bob are thoroughly unqualified diplomats chosen solely by being in the right place at the right time; peace pleas with substance are ignored in favor of visually pleasing circus shows; wars are egged on by those who stand to profit financially from the conflict. All points are timeless and presented by screenwriters Myers and Mankiewicz (MILLION DOLLAR LEGS) in a fashion that never lets satire overwhelm the comedy. Bert and Bob wake up to these ladies. Who needs an alarm? Unlike the satire, the rampant un-PC humor does get in the way on one glaring occasion, with the climactic setpiece "No More War" turning a U.N. conference into a minstrel show. Thankfully, it's barely two minutes of screentime, but the film couldn't lose the scene as it is key to the plot (unlike, say, the awful and often snipped President's Day number in 1942's HOLIDAY INN). This set piece is likely the biggest reason DIPLOMANIACS stays on the shelf whenever TCM trots out HIPS, HIPS, HOORAY, HOLD 'EM JAIL and other Wheeler and Woolseys for periodic late night mini-marathons. Just be forewarned its here; I'll get off the soapbox. With these two releases Warner Archive has made two more dollops of comedy history from vastly different eras available. Here's hoping I'll be writing about further releases that are Missing No More from DVD in the future. Next post, I'll be writing about a film that is unfortunately still missing from DVD: Number 75! I don't really get why TCM doesn't show Diplomaniacs, yet did release the DVD. AMC used to show it back in the early 90s and the film was out on a VHS as well. It's still being held hostage in my father's storage area, but I hung onto my VHS copy of Diplomaniacs. An incredible comedy. And it's nice to know I'm not the only one who thinks highly of Cockeyed Cavaliers. Definitely Bert and Bob's best.